Annie Koyama is an interesting publisher because she's willing to take risks in publishing books that she finds to be visually interesting. Whether or not they're comics in the familiar sense is not all that important to her. Indeed, many of the earliest books she published could be deemed as art books, with comics only becoming a focus for her later on. In publishing Robin Nishio's photography book Wailed, she's taking both a short and long-term view. 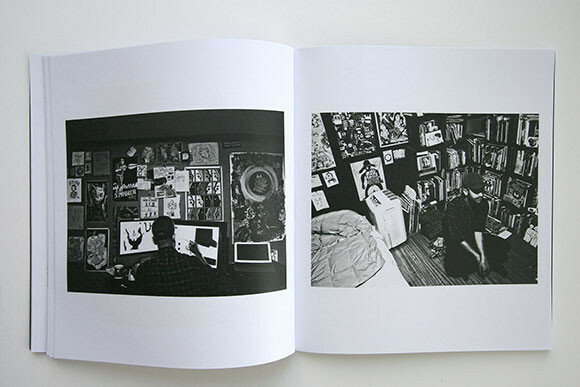 In the short term, this is a book, as cartoonist Michael DeForge notes in the afterword, that captures cartoonists in the rare times when they are not isolating themselves in front of their drawing desks. These photos zero in on specifics, peculiarities like odd socks or special tattoos. They are all in black and white, capturing a certain timeless starkness in the proceedings. We see three alt-comics participants three to a bed at a convention, trying to desperately catch a few minutes of sleep. We see them playing music, we see them at karaoke, and we see them at dinner. 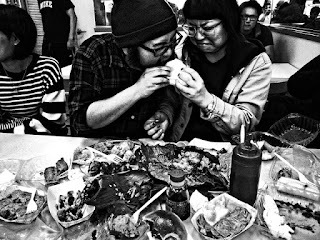 In a particularly funny and telling photo, Calvin Wong and Hellen Jo are sharing some sort of torta at a restaurant. Jo's recoiling reaction as she sees that a fly has alighted on it is priceless, and it's reflective of the almost desperate way cartoonists wind up eating at shows when they have little time. There are pictures of cartoonists doing nearly everything but drawing. The shots taken outside are especially telling, but every photo is interesting simply because it's not just of a cartoonist not at work, but of a cartoonist participating in and creating a culture and a scene. That's the short-view version of the book: a snapshot of how the creators of today's alt-comics culture are like when their tribes come together on rare occasions. The long-view version will be even more interesting, as this book could become a crucial anthropological and historical touchstone. Fifty years from now, this book will provide context for a particular period of art and artists. Whether that context will be part of a continuum, or whether it will be of interest because of its status as an extinct phenomenon is an open question, but this book shows that documenting this period is important.